Every year around this time I start thinking about biscuits and sausage gravy! Last month we celebrated our 8 year wedding anniversary and that always brings to mind our honeymoon. 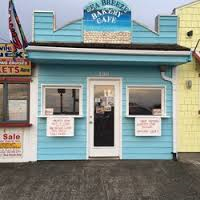 We had some wonderful food, but the meal that sticks in my mind the most is the biscuits and sausage gravy that we had at The Sea Breeze Bakery and Café on the boardwalk just down the road from our hotel in Depot Bay, Oregon. It is the cutest little café nuzzled in between another restaurant and a little gift shop. The atmosphere was laid back, and homey, and that probably added to the overall enjoyment of the meal. 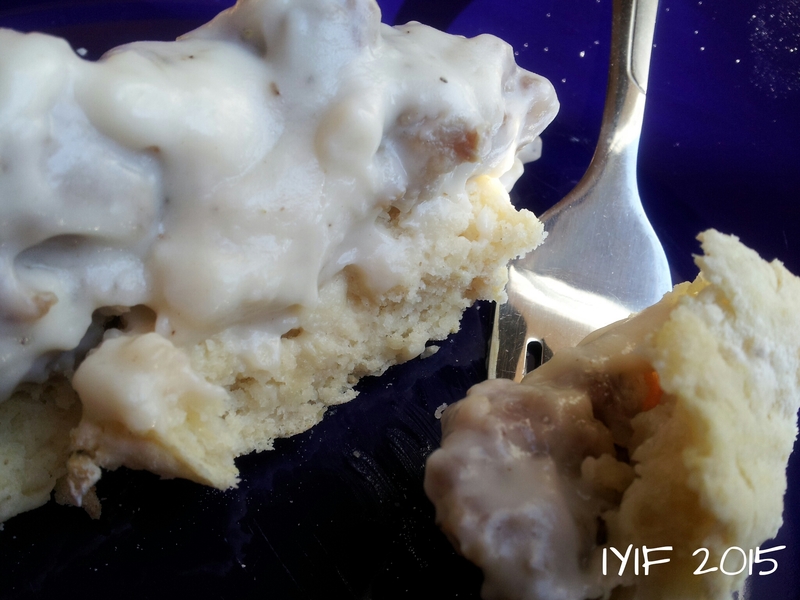 I was never, ever, a fan of biscuits and gravy growing up, but on our honeymoon I thought that I would give them another try, and I am certainly glad I did! 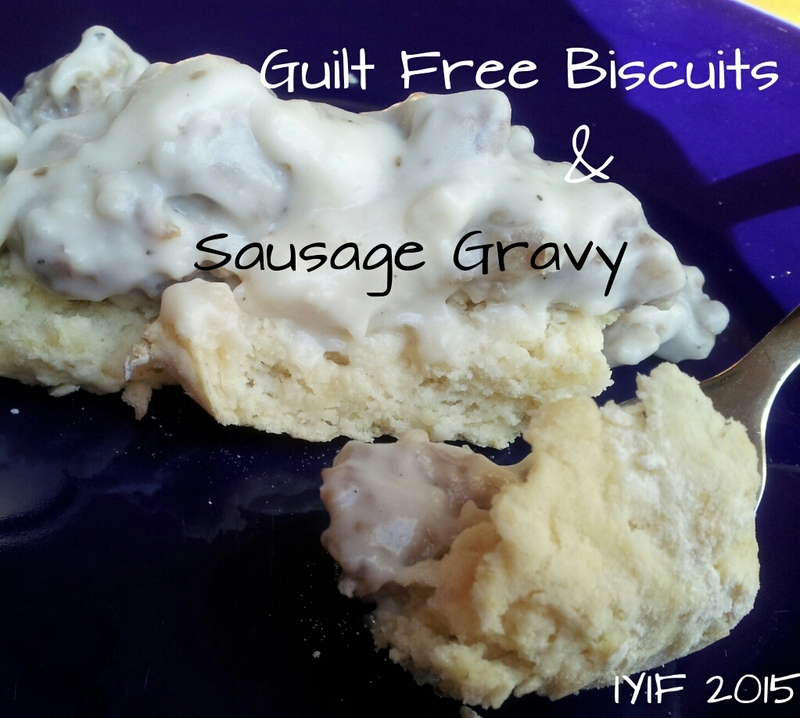 The biscuits were tender with a touch of sweet, the gravy was creamy, and the sausage burst with flavor. After a couple of tries over the years I gave up on trying to find any other biscuits and gravy that would be equal to those that I ate that morning, so this morning I figured I would just see what I could do in my own kitchen. Being on vacation I didn’t even worry about the calories, but I know that they were well over 400 scrumptious, creamy, sausage filled calories. 🙂 While making my version this morning I wanted to stay true to my goal of making a lighter version that tastes just as good. All I can say is I came as close as I’ve ever tasted and rolled in at 170 calories for one serving. I want to let you know that these biscuits aren’t the kinds that are in layers, like you’d find in a tube from the store. 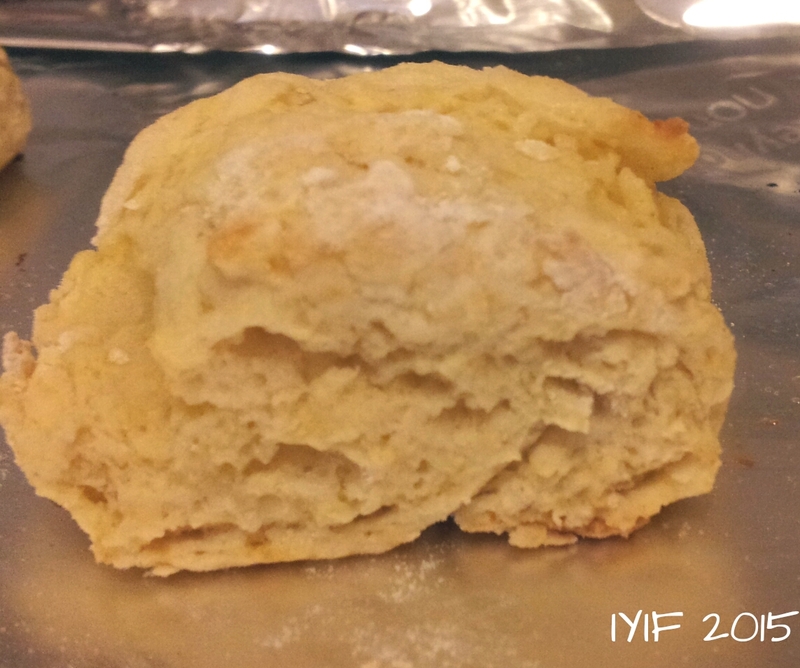 The biscuits I had that day weren’t layered either, and that was part of their charm and flavor. I had to make two different batches before I found “the taste”. The first batch tasted too much like baking soda and had too much butter, if you can believe there is such a thing. 😉 I kept them on the light side by using light butter and unsweetened vanilla almond milk that I made into “buttermilk” with some apple cider vinegar. (This helps with the leavening and the tenderness.) I also wanted a little sweet and savory contrast so I added some Truvia zero calorie sweetener. In saying that, I will alert you that you should be on the lookout for a strawberry shortcake recipe next year using the same biscuit recipe. When making the biscuits I used my hands to cut in the butter so I could leave big chunks like I did in my Stone Ground Scones, and used a fork to gently mix the almond milk into the mix. You want to be sure that you don’t over mix the dough so that it doesn’t get tough. I also folded the dough in thirds, rolled it a second time, and then folded it again before cutting it into squares with a knife. (This allowed for a few layers to hold onto the butter.) I didn’t want to have to reroll the scraps and risk it getting tough. 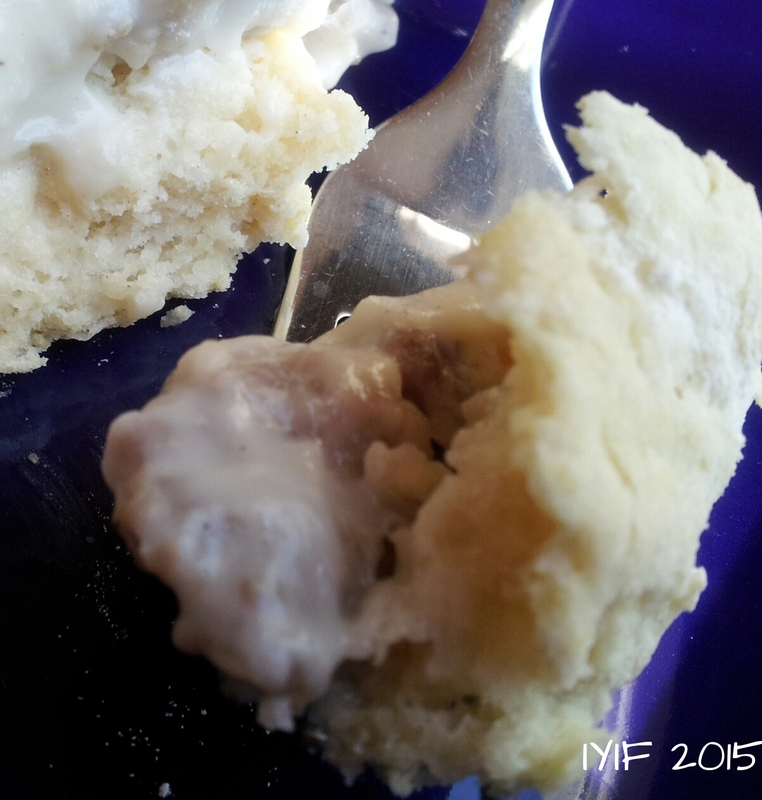 When it came to the gravy I kept it light using the same light ingredients, light butter and unsweetened almond milk. I like just enough gravy to hold the ground pork together, but not so much that it is flooding the plate! So, if you like extra gravy, you may want to double the batch of white sauce before you put in the meat. 🙂 My little trip back to the shore made for a nostalgic morning that brought back a lot of enjoyable memories. If you already have the ground pork cooked you can have this breakfast, or brunch, on the table in less than 30 minutes! Sit back, relax, and enjoy! While the biscuits are baking you can cook up your ground pork sausage into fully cooked crumbles. Drain and set aside.